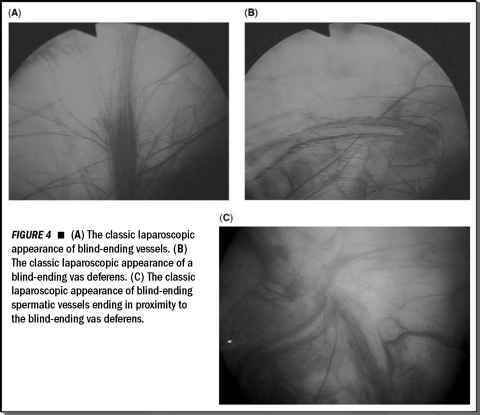 In the landmark report of surveillance of kidney tumors, Bosniak et al. retrospectively reviewed the imaging of 40 incidentally detected, less than 3.5 cm renal masses that had been followed for a mean of 3.25 years. Twenty-six tumors were eventually removed after an average of 3.8 years and 84.6% of them were histologically renal cell carcinomas. Variable tumor growth behaviors were observed and the overall mean linear growth rate was 0.36 cm/yr (0-1.1 cm/yr). Nineteen tumors grew less than 0.35 cm/yr and no patient developed metastatic disease (44-46). More recently, 17 small renal tumors in chronic haemodialysis patients with acquired cystic kidney disease were followed for a median of 2.1 years before performing nephrectomy. The overall growth rate, reported as volume, was again variable (0.07-17.34 cm3/yr) and significantly greater in high-grade carcinomas, while 65% of the tumors had a volume doubling time of more than a year (47). In another retrospective study, Oda et al. observed 16 patients who were initially observed with incidentally diagnosed but histologically proven renal cell carcinoma. The tumor growth rate varied from 0.10 to 1.35 cm/yr and was significantly lower than that of metastatic renal cell carcinoma lesions observed in a second group of patients (p = 0.016) (48). Other authors have reported that localized primary tumors have a clinically significant lower rate of growth if compared to either primary advanced or metastatic lesions (7). In the first prospective study of watchful waiting of renal tumors, we reported a series of 13 patients incidentally diagnosed with a small, less than 4 cm renal mass and followed expectantly because they were elderly or unfit for surgery. We hypothesized that the tumors that are destined to grow fast and possibly metastasize do so early, while most small tumors grow at a low rate or not at all (49). 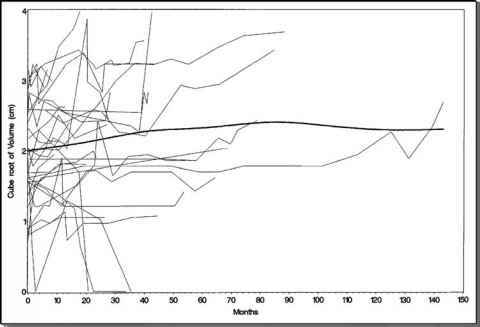 FIGURE 1 ■ Individual observed patterns of growth rate over time of 32 small renal masses managed with active surveillance. A summary curve indicating the average growth rate is superimposed (heavy line). and each mass had at least three follow-up measurements. Tumor volume in addition to single and bidimensional diameters was calculated from each follow-up image or report. Nine masses in eight patients were surgically removed after an average of 38 months of follow-up because of the surgeon's concern or the patient's anxiety that the tumor was enlarging. All tumors were clear cell renal cell carcinoma except one which was an oncocytoma. The overall average growth rate, considering the cube root of the volume, was 0.1 cm/yr (not statistically significantly different from no growth; p = 0.09) and was not associated with either initial size (p = 0.28) or mass type (p = 0.41). Seven masses (22%) reached 4 cm in diameter after 12 to 85 months of follow-up. Eight (25%) doubled their volumes within 12 months. Overall, 11 (34%) fulfilled one of these two criteria of rapid growth. No patient progressed to metastatic disease, while two patients died of unrelated causes (51). A similar experience has been recently reported by Kassouf et al., who serially imaged 24 patients with small renal masses. Most of the tumors did not demonstrate significant growth during the surveillance period. The mean growth rate of the five fast growing tumors was 0.49 cm/yr or 7.3 cm3/yr. The four tumors that were removed during the follow-up were all histologically renal cell carcinoma (three clear cell and one papillary type). No metastasis was documented (52). The standard of care for small localized renal neoplasms is either radical or partial nephrectomy. There is important variability in the growth patterns of small renal masses. A small number of tumors grow rapidly after diagnosis, but most of them have a natural history of slow growth and are not likely to metastasize. In our experience, only 34% renal masses had a clinically significant growth over time. The association between growth rate and tumor size at diagnosis was not found to be statistically significant. It is important to note that in all the series no tumor progressed with metastases during the surveillance period.